Sara Berman's gloriously fastidious closet. Looking out across the august grounds of Independence Mall, you can see the impressive bronze statue of George Washington in front of Independence Hall, hand on a book, reflective gaze, a suitable pose for a heroic founder of a country. A block away, at Sixth and Market Streets, a memorial to Washington and his noble presidential successor John Adams rises in the stately brick form of the President’s House. Names and monuments for the ages. And from Friday through Sept. 2, you’ll be able to see “Sara Berman’s Closet,” with its neatly folded linens and underthings, the first outdoor installation of the National Museum of American Jewish History at Fifth and Market Streets. This is not a joke, although it is humorous. Maira and Alex Kalman, who created the "Sara Berman's Closet" exhibition outdoors of and inside the National Museum of American Jewish History at 5th and Market Streets. “Sara Berman’s Closet” tells the story of someone not famous, not a nation-builder, not a writer, not a celebrity of any kind, but someone who speaks volumes about the possibilities inherent in all lives and the value of even the smallest things. And she speaks through that most mundane domestic space, the space that most people keep out of sight, the space where who knows what might reside within – the closet. “The sense of order and clarity was so palpable,” Maira Kalman said recently as she and Alex Kalman took a break inside the museum from setting up the exhibition that accompanies the closet and that creates a sometimes-fanciful timeline for Sara Berman, who was born in 1920 in Belarus and died in New York in 2004. Excerpt from "Sara Berman's Closet" by Maira and Alex Kalman. Illustrations by Maira Kalman. Design by Alex Kalman. Harper Collins, 2018. “The beautiful care of things, the ironing and starching. You open the linen closet and it was a thing of beauty, and that really entered into our thinking about life,” she said, recalling growing up. Maira and Alex Kalman, in front of a photograph of the Sara Berman, take a break from installing their "Sara Berman's Closet" exhibition. 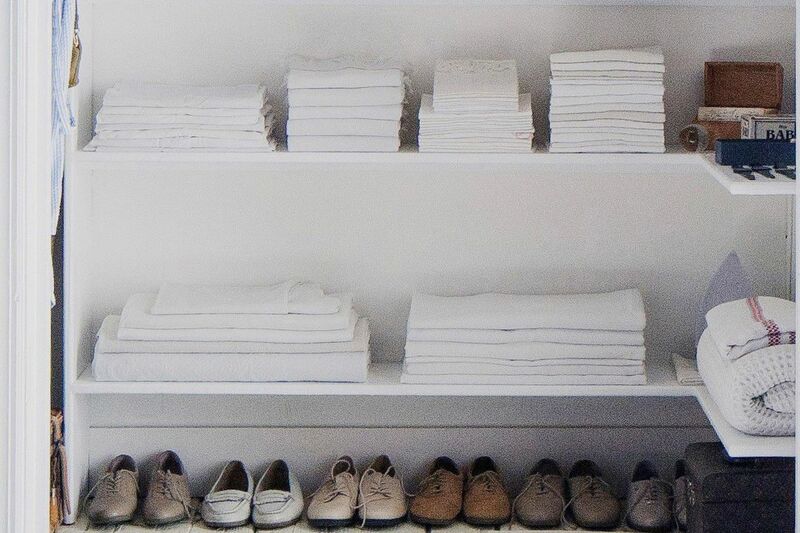 For Sara Berman, her beautifully laid out closet, with its place for the three watches she wore, the sheets, the seven hats, the nine pairs of shoes, the seven bras, the undetermined number of pants, the 13 blouses, the 12 T-shirts, and all the rest must have represented order and clarity. Yes, that is the closet reconstructed on the museum’s Kimmel Plaza, a recreation of Sara Berman’s closet as she left it in her studio apartment on Horatio Street in Greenwich Village. And those are Sara Berman’s socks and undergarments, meticulously ironed (yes, she ironed her socks and underwear) and neatly folded and placed precisely into an ordered universe behind a closed door. The journey to that apartment, chronicled by the exhibition inside the museum, lends texture and insight to the closet outside. Through Maira Kalman’s paintings and Alex Kalman’s sculptures of daily objects – potatoes, spare ribs – Sara Berman’s life unfolds. Maira Kalman places sculpted and painted potatoes on stool while setting up Sara Berman's Closet. She was born in the village of Lenin in Belarus, where her grandfather’s six-foot beard once saved her from drowning in the River Sluch (she grabbed hold and pulled herself out), and where a cousin was killed by a bolt of lightning that came through the window as he sat reading at a table in a cabin, and where everyone was murdered in pogroms shortly after Sara’s family departed. The family moved to Palestine in the 1930s. There, Sara met her future husband, Pesach, who fought in the Zionist underground. They eventually moved to New York. But all was not well in the relationship, and after nearly four decades together, Sara and Pesach separated. She moved to Horatio Street. Maira and Alex Kalman working on the Shack from Belarus in the installation of the "Sara Berman's Closet" exhibition at the National Museum of American Jewish History. It was on Horatio Street, living alone for the first time, that Sara Berman fully became Sara Berman. In an epiphany, she decided to wear only white. No one is quite sure why. Perhaps the better question is why not. There she assembled the now-museum-quality cookie press and whisk, the funnel, the ladder, the chair, the broom that are on display, although when she acquired them, these utilitarian objects were just that. It’s what she used them for and produced with them — there’s the magic. Sara Berman ate a lemon ice while standing on a beach in Israel, waves lapping at her feet, on the last day of her life. In 2015, the first iteration of the closet went on exhibit at the tiny Mmuseumm, an exhibition space founded by Alex Kalman in lower Manhattan. The next year, it moved to the American wing of the Metropolitan Museum of Art. It traveled to Los Angeles for a run at L.A.’s Skirball Cultural Center. And now it is here. What would Sara Berman think about her closet on display on Independence Mall across the way from Washington’s old house and in the shadow of Moses Jacob Ezekiel’s monumental sculpture Religious Liberty? Friday through Sept. 2 at National Museum of American Jewish History, Fifth and Market Streets. Hours: 10 a.m.-5 p.m. Tuesday to Friday, 10 a.m.-5 p.m. Saturday and Sunday, closed Mondays and on April 20 for the first day of Passover. Closing at 3 p.m. on April 19. Admission: $15, adults; $13 seniors, youth 13-21, and students with ID. Free for children under 13.